The Fantastic Four Marvel Series slot machine from Playtech is a 5 reeler with 50 lines to bet on. The Fantastic Four is based on the old Marvel classic where a group of four super heroes fight against the evil doers. The visual appearance of this slot is surprisingly not based on the 2005 movie but instead based on the visual appearance of the comic book. This is very obvious when you see the characters – the Fantastic Four – and how little they resemble the actors from the movie. The main plot in the Fantastic Four is that the four heroes have four unique super powers. This is adapted to the slot machines free game feature where you win a number of free games which include features from the four super heroes. As mentioned above, the Fantastic Four slot machine is not visually based on the latest movie. The slot machine has a very nice comic book look which is nice in comparison to the other slots in the Marvel series from Playtech. The sound and speed of the game is outstanding. The Fantastic Four is a great slot machine. Well, it wouldn’t be fantastic if it wouldn’t contain the Fantastic Four - Mister Fantastic, Invisible Woman, Human Torch and The Thing are of course the main symbols in this game. The wild is the symbol of the 4 plaque and it will substitute for all symbols except for the scatter. The scatter is the World symbol and if you hit three or more of this, you will trigger the free game feature. The lower paying symbols are 10, J, Q, K and A. The Fantastic Four does not have a gamble feature. The bonus feature is included in the free games where you can cover the third reel with one of the Fantastic Four characters. When this happens, each of the four heroes will add another 4 free games to the 12 original free games. The Mister Fantastic symbol will become an expanding wild symbol during the free games. Invisible Woman will increase the multiplier. The Human Torch will remain on the first reel during the free games and The Thing will give you 3 extra free games and freeze on the reels where he appears and act as a wild. 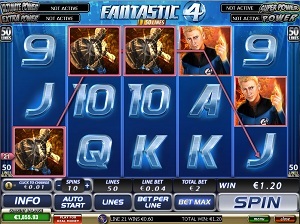 The Fantastic Four slot is a 5 reel machine where you can bet on a total of 50 lines. Usually, a slot machine has 25 lines but the Fantastic Four has doubled that. On each line you can bet a minimum of 0.01 to the maximum of 1 currency credit.